← Day 94: Get on Pinterest. Many possible scenarios flew into my head when I first spied the words ‘Sage Fair‘ on the page. Had there been a bumper crop this year that was worthy of an entire festival devoted to the lovely herb that we most commonly associate with Thanksgiving stuffing? Or perhaps there was an inordinate number of wise men with flowing white beards who were getting together to auction themselves off to the highest bidder for their advice dispensing services? 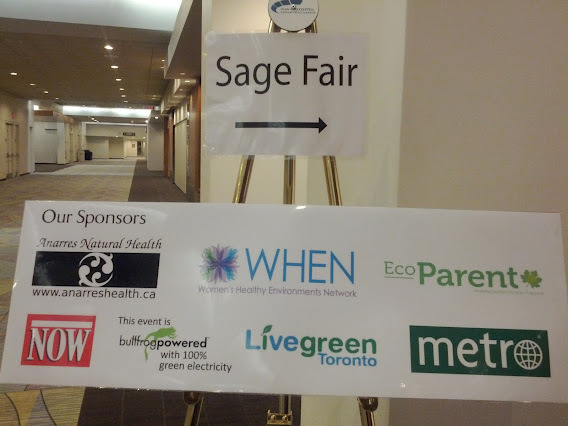 And then, contrary to every single instinct in my core being, I kept reading the rest of the voucher’s details, only to discover that it was for a 2-for-1 entry to a healthy green living show ($10 for 2 tickets, $20 value) at the Metro Toronto Convention Centre (MTCC). Since I could always use something new to do, I bought it. Now, to be fair, the major artery into downtown was closed today for a charity bike ride, which may have explained some of the low attendance numbers, but this was easily the smallest audience at such an event that I have ever seen. In fact, some of the vendors were packing up their booths when we arrived, even though the show was not supposed to be over for at least another few hours. They had simply had enough, as apparently, the day before had been even worse. Not being much of a fan of big crowds, I was actually enjoying the exclusive privilege of being able to go right up and talk to any vendor who piqued my interest. 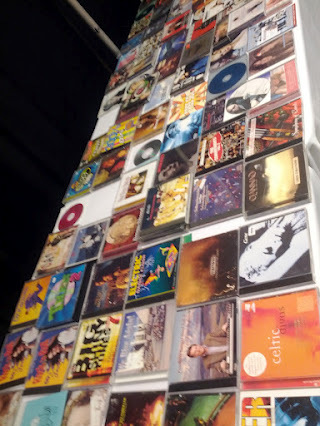 We started by perusing the friendly Swapsity Eco-Swap, where I wasn’t sure if I should be offended or not to find a lot of my favourite CDs and books in there. Apparently, some people had moved on. I’m personally not yet ready to succumb to such peer pressure, green though it may be. The next exhibitor who caught my attention was Andrea Ramirez from Frontier Health Naturopathic Clinic Dispensary in Burlington. She was giving a very passionate presentation on everything from auricular therapy to organic produce. Next to the workshop area, the always insightful Adria Vasil of NOW Magazine fame was on hand to sign copies of her latest book, Ecoholic Body. 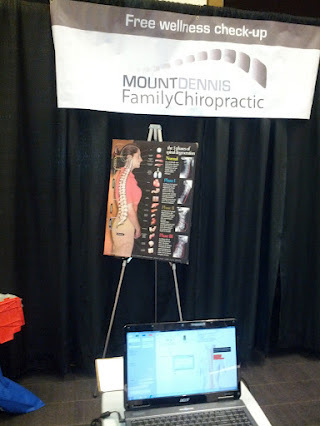 A little further down the aisle, we were treated to free posture analyses from Tony Van Hoof of Mount Dennis Family Chiropractic. So far, it was all good stuff. The last stop on the circuit for me left the biggest impression, by far. 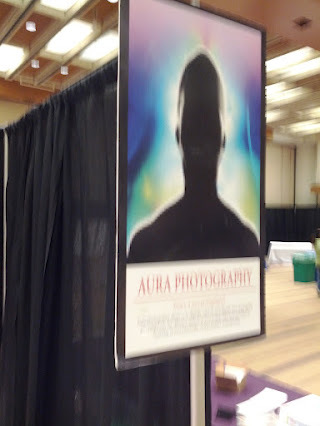 You know new technology has truly infiltrated every possible market when there’s now an app that takes pictures of your aura. I kid you not. For $10, I learned that, courtesy of not one, but two photos, taken with the iAura app on an iPhone, my aura was black in colour. Now, this was sufficiently disconcerting news all on its own. But to then have a short reading thrown in that informed me there would be a lot of tears shed over the upcoming year, and without even a comforting cocktail to offer in consolation? Oh, the humanity! I blame you, Steve Jobs. This app business has clearly gone one step too far. On the way home, the weather cleared up, so I decided to take a stroll through the Riverdale Art Walk happening in Jimmie Simpson Park to distract me from my nebulous vibes. Between the sunshine and the cheery canvases, this show did not disappoint, and the cloud over my head was instantly lifted – at least, in my mind. 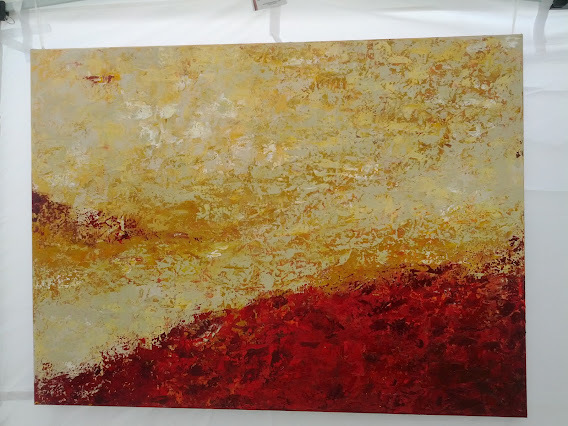 I always enjoy the exhibits on offer at this annual event, and I simply fell in love with the following nature-inspired original from Kate Taylor, who will be in the Solid Colour show this weekend if you happen to be looking for something to do. The colours in it just make it so gosh darned pretty, at least, to the eye of this beholder. 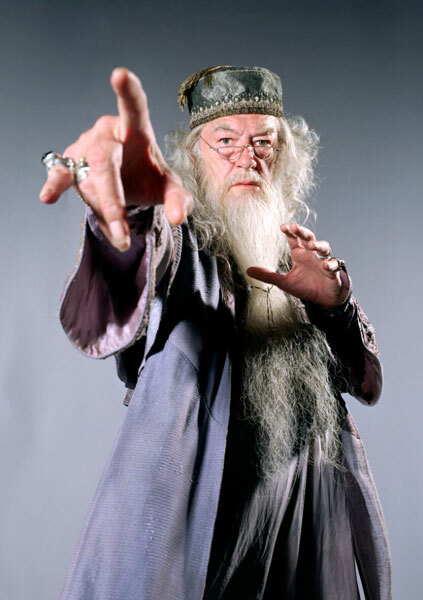 Where’s Dumbledore when you need a sage second opinion? Good help really is hard to find these days… Sigh. This entry was posted in Health and tagged deal, health, June, Metro Toronto Convention Centre, Riverdale Art Walk, Sage Fair, Toronto, voucher. Bookmark the permalink.